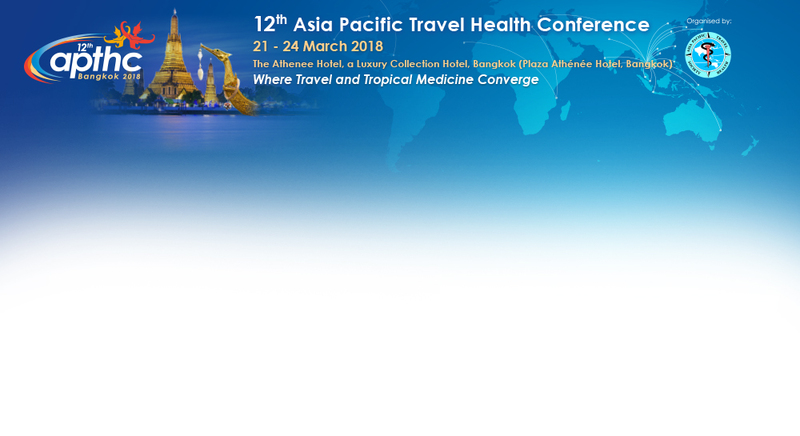 Welcome to the 12th Asia Pacific Travel Health Conference (APTHC 2018), taking place in Bangkok, Thailand from 21-24 March, 2018. The APTHS has now been promoting, advocating, and networking travel health in the Asia-Pacific region for over 10 years. We unite and provide a forum for travel medicine communities from the diverse group of countries constituting the vast continent of Asia. While our issues may differ somewhat—due to factors such as population, geography, climate, culture, heritage, and language—we share a common thread, our passion for healthy and safe travel. International and regional travel and tourist arrivals are growing most rapidly in the Asia-Pacific Region. This brisk growth in global mobility brings with it increasing challenges and health risks for travellers and host populations alike. We seek to educate travel-health practitioners, the travel industry, and the traveling public, to maximize the benefits and to minimize the risks of travel for all. We have held conferences in Hong Kong, Taipei (Taiwan), Bali (Indonesia), Shanghai (China), Kuala Lumpur (Malaysia), Melbourne (Australia), Nara (Japan), Singapore, Ho Chi Minh City (Vietnam), and Kathmandu (Nepal). If you are a travel-medicine practitioner (or would like to be), this is your organization. And we need YOU to make it strong. Membership is free now. You can join just by clicking the link on this website. Membership will get you access to this vibrant community, and discounted registration for the next conference of the Asia Pacific Travel Health Society. More details about the Thailand Conference will follow soon. Watch this space! We are looking forward to hearing your ideas, discussing new challenges and improving our outreach activities.